Since that last Ford Capri rolled off the production line in Cologne, a Brooklands 280 on December 18th1986, the following for the charismatic coupe has become stronger than ever. The aim of Capri Club International is to guarantee a following of owners and enthusiasts who realize that the Ford Capri is a modern day classic and wish to keep the legend alive. The Club was originally established in 1982 and is indeed the largest single marque Ford club in existence. So don’t wait to join, because one of the most popular comments people make having joined the Club is that they wish they had done it earlier, not only do they save on motoring expenses but they get one hell of a package of fun. By waiting until your Ford Capri is back on the road you are missing out on a lot of advantages. 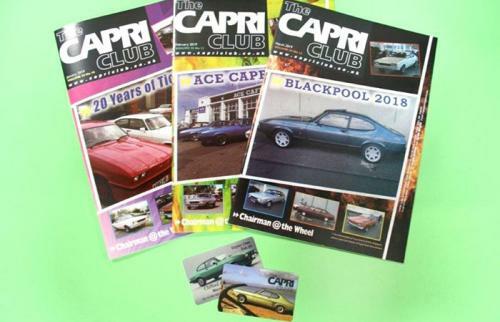 The monthly magazine contains articles and stories on members’ Capris, covering all aspects of Ford Capri ownership and a history. The comprehensive second hand sales section includes choice items of the Club stock and members ‘For Sales & wants’ listings. Now available through our online shop as well as through the Club Mail Order Catalogue, the Club range of spares, accessories and regalia is designed to assist owners in keeping the Capri legend alive. The Club sources difficult to find spares and remanufactures obsolete parts where possible. For everything else we have a comprehensive collection of second hand spares available! From Technical to unbiased buying, selling and restoring advice, the Club offers it all from the best place to get your Ford Capri restored to which Brake Conversion will best suit your needs. Technical advice available by email, fax or letter. Preferential insurance rates are offered by several companies recommended by the Club, savings exclusive to Club Members only. Having confirmation of the value of your Ford Capri from the Capri Club stands you in good stead, should you have a dispute following a claim. The Club HQ hosts two annual Capri events, Capris Mild to Wild, The National Concours Day while the local affiliates host their own smaller events all over the country. Imagine the buzz, driving to any one of the events in the UK, you’ll notice Ford Capris on the motorway, where are they going to? Some sort of event that will be full of like minded people and Ford Capris, where everybody is swapping stories and catching up. You can participate in this! Don’t forget that the Ford Capri is quite unique in the spectrum of ownership, our members are people from all walks of life, from all age groups, all with a different view point of what a Ford Capri should be. You will find people that share your view point. Okay, it could be controversial, you could be out for originality, or you could be out for personalization, it doesn’t matter you’ll fit in.